Each year PACEperformance offers a unique training opportunity for anyone who might be interested in getting a jump on the spring training scene. All fitness levels and abilities are welcome. 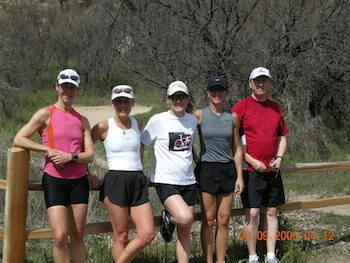 PACEperformance has been organizing warm-weather triathlon, biking and running camps for nearly three decades. Each camp has a different focus and before each participant arrives, we make sure we have an agenda that will meet your specific needs. Tucson Arizona has become one of North America’s greatest training cities for cycling, triathlon, running, hiking and yoga/core. With over 325 sun filled days, it’s the perfect place for an active, warm training vacation. YOUR COACH: A multiple Ironman finisher and owner of PACEperformance, Greg Pace has been coaching Triathletes for more than 30 years and is one of the most respected minds in triathlon. He has coached all levels of athletes, ranging from absolute beginners to world champion contenders. He has established PACEperformance to be a premier age group athlete training organization and trains athletes who race all over the world at every distance. Greg will be the head coach for the 2017 Triathlon Camp. MT LEMON FACTOR: No City in North America has a more exciting series of different ride routes to pick from. Most famous is the epic 25mile/40km MT LEMMON ride. Start with cactus in the desert at milezero and end the 25 miles next to the snow-boarders at the top of Mt Lemmon and get your well-earned cookie or slice of pizza at the top of the mountain. Camp staff always supports all riders with van support up the mountain. HEATED OUTDOOR SWIMS: For 2016 we have access to the newest pool in Oro Valley – only 4km from our condos. This heated outdoor facility features a 50m long by 46m wide lap pool, with brand new well appointed heated and air conditioned change rooms and showers. Even if you’re not in a triathlon camp, there is still a chance to get in a swim or two during the week. The camp condos also have a large pool and hot tub right on site for easy swims or cooling off and relaxing. Please note there are a limited number of these units available. They will be reserved on a first come first serve basis. ROOMMATES: If you are looking to reduce costs by sharing a room, we will do our best to identify a suitable roommate for you. TRI-CAMP FOCUS: Each athlete will be following customized programs that are designed to meet your specific needs. In general, tri-camps will focus on 1) cycling, 2) swimming, 3) running, 4) core & injury prevention and 5) hiking/seminars. Individualized changes will be made based on specific participant needs. TUCSON HIKES: Tucson has some of the most prestigious hikes in the world. Each tri and bike camp will have 1-2 optional, awesome hikes during the camp. For those who have been to previous camps, additional new hikes will be added for 2016. GOLF: for those who may enjoy a little putting around, Tucson boasts some of the best golf courses in the world. Anyone interested in a mid-week departure from the swim, bike and run can join us for a leisurely, (yet most likely, frustrating) golf day. Golf would be a pay as you go option and is not included in camp fees. VAN SUPPORT: Each camp has an option of going in the team van or having your own transport, to give you more freedom. BIKE TRANSPORTATION: We are exploring the option of having someone drive a van down with bicycles. There will be an additional cost for the service. Stay tuned for updates. Prices in USD and all in. No taxes to be added. A $200 CAD non-refundable deposit is required to reserve your spot. Once a deposit has been received, camp coaches will send you more information to fine-tune your accommodation, transportation, bike transport, camp goal needs. Camps can be extended by starting 1-2 days early or staying 1-2 days longer. A small additional fee will be included to cover the extra condo days. No extra cost for non-camp partners who are staying in your room during the camp.